« Other than Obama and Krugman, Is there Anybody Who Still Thinks Bigger Government Is Good for Growth? 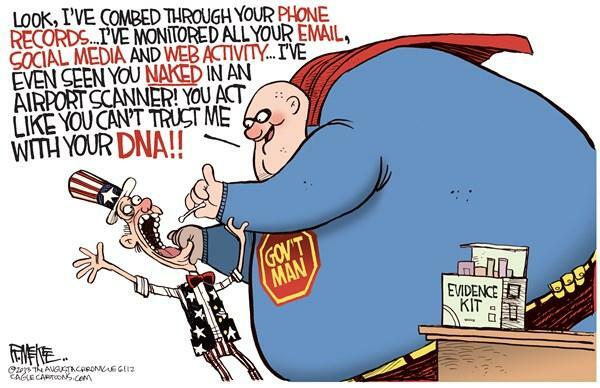 It’s a Bird, It’s a Plane…It’s Government Man! I’ve used the Superman theme to make fun of Obama’s shallow understanding of the Constitution and to express disgust about a bureaucrat ripping off taxpayers. Now there’s a well-timed Jim McKee cartoon that looks at government’s super intrusiveness. Jim McKee is relatively new to me, but he does great work. You can see some of his other cartoons here and here. Regular readers know that I’m very fond of cartoons that portray government as fat and bloated slob. For other examples, see here, here, here, here, here, here, here and here. It’s actually Rick McKee, artist for the Augusta Chronicle (Augusta, GA). on June 16, 2013 at 12:21 pm It’s a Bird, It’s a Plane…It’s Government Man! Humor is typical consolation on the road to serfdom. It is part of the standard path to decline. Europeans are daily making fun of the mandatory collectivism they have empowered their bureaucrats with. They make fun, they laugh… And then vote otherwise. Because they cannot resist seeing the voting booth as a redistribution machine to lower incentives, stifled competitiveness, and decline. That seems to be the new American dream. A good laugh makes it a little easier to capitulate to what seems inevitable.